Earlier this month, federal agents raided the medical staffs of five NFL teams. They were looking for prescription drugs, on the heels of a class-action suit alleging that the NFL has been doping up its players for years, pumping them full of painkillers because it was the only way they could possibly stay on the field. It is an old story. 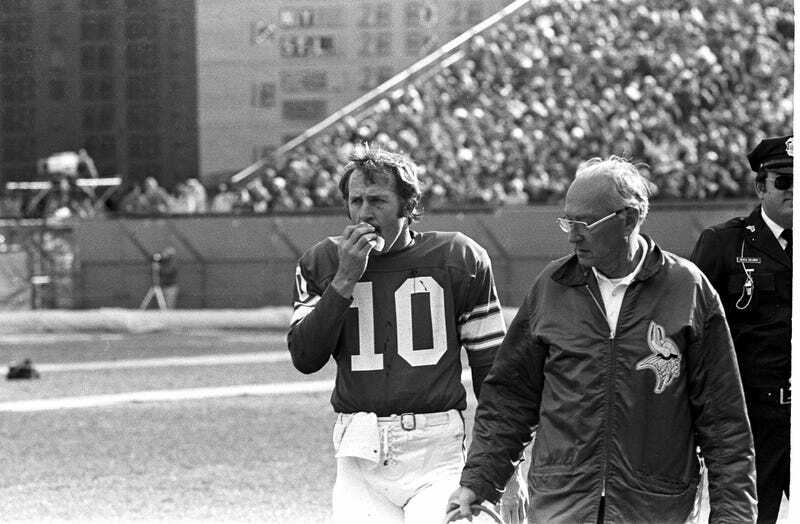 Writing in the Pioneer Press, hall-of-fame quarterback Fran Tarkenton recalls his 1974 season with the Vikings. I took a hard hit to the shoulder in Dallas, and I was in a lot of pain. Every Friday for the rest of the year, I got a shot of butazolidin in my shoulder. I couldn't throw or practice during the week, and it didn't even really help with the pain, but I played on Sundays anyway. I couldn't throw the ball more than 40 yards, and I had nothing on it, but I got by on guile. Butazolidin is a painkiller used on horses — and it is now illegal for human use in the United States. I took it every week for a whole season. We went to the Super Bowl that year, losing to the Steelers. Charlie Pierce, getting to the heart of the DEA raids and the larger issue of anti-drug hysteria, describes the idea of drug-free sport as "a completely ludicrous fantasy," and states that "human beings virtually never have competed at the higher levels of athletic competition without some sort of artificial assistance." But he draws a distinction between using science and medicine to maximize athletic potential, and doing so without properly informing the guinea pigs of the risks of what's being pumped into their bodies. Fran Tarkenton had no idea that butazolidin, which would later be banned by the FDA (and largely replaced in the NFL by toradol), carried the risk of permanently damaging his bone marrow, or hindering his white blood cell production. Luckily for him, none of that happened—but the constant numbing of the painkiller led him to permanently damage his arm, simply because his brain wasn't receiving the warning signals his shoulder was sending. When I retired after the 1978 season, I had tremendous pain in my shoulder. I went to an orthopedist, who told me he was shocked at what he saw. I was 39 years old, and he said I had the shoulder of a 75-year-old man. My shoulder had to be replaced. I couldn't throw a pass even if had I wanted to. I struggle today to put on a suit jacket because of my shoulder problems. I often hear people say, "Football players know the risks. It's their choice to play." Well, nobody told me I could permanently destroy my shoulder by injecting these toxins. First, my team doctor just gave it to me, no questions asked. And yes, I continued to take those injections for the rest of the year. The team doctor was like my family doctor — I trusted him. Trusted that he wouldn't give me something that would destroy my body. Trusted that he had my best interests at heart. It's difficult to conceive of today, knowing what we know and as obvious as it seems now, but football players didn't always realize what they were signing up for. And that's the key to both the concussion and the prescription-drug lawsuits. It's not that the NFL was forcing anyone to ruin their lives; it's that it wasn't even giving the players an informed choice.